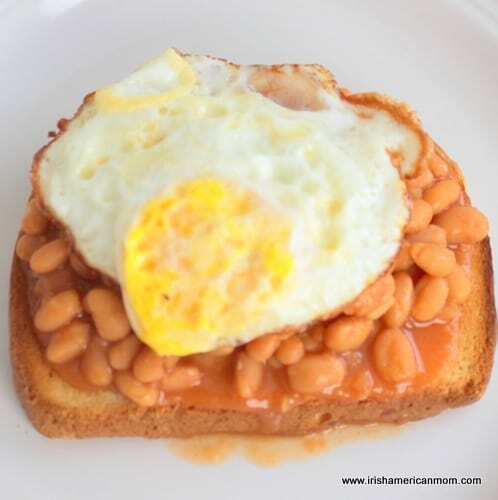 Beans on toast featured regularly on my lunchtime menu as an Irish kid – a simple, nutritious meal I’m quite certain continues to be eaten regularly by many Irish and English children. An American friend once asked me about Irish lunchtime menus. Peanut butter and jelly sandwiches are the all-American, easy, lunchtime staple. No PB & J for me when I was growing up in Ireland. Even after spending over twenty years in the United States, I still don’t appreciate them. I must confess I find it very hard to eat a peanut butter sandwich. The whole bread, jelly, and peanut butter combination is just too sticky for my Irish trained palate. When posed with this Irish lunchtime inquiry I had to think for a minute before answering. What is the inexpensive, go-to lunch for Irish mothers? The answer I believe is beans on toast. Now it’s not a menu item for school lunch boxes, but for midday meals served at home, beans on toast are just perfect. In fact, beans on toast may be found on breakfast, lunch and dinner menus in many Irish or English homes, especially when budgets are tight. Should I use a singular verb after beans on toast, or the plural form? Beans on toast ‘is’ or should I type beans on toast “are”???? Not sure what the answer is, but I hope you’ll forgive any beany grammatical errors. Many Americans are probably saying “what’s the deal?” For those whose palates are trained on spicy foods this meal may seem very bland. But let’s face it, we Irish think salt and pepper are spices, so beans on toast suit us perfectly. And into the bargain they’re cheap and easy to store. A can of beans in the pantry and you’re set. Heat some beans in a saucepan. Toast a slice of bread. Butter the toast if you wish. Then pile the beans and sauce on top. Some beans on toast connoisseurs forego the butter, but I find a slice of thick white toast spread with Kerrygold butter is a perfect bean base. The salty butter adds a lovely complimentary flavor to the beans. To beef the beans up for dinner, a poached or fried egg can be served right on top. I suppose beefing them up is the wrong word when using an egg, but you know what I mean. I hope you like how over cooked that fried egg is by American standards, but that’s how they turn out when fried Irish style. No sunny sides up or over easys for an Irish cook. Another option is to top them off with a slice of grilled or fried tomato, and two slices of bacon or rashers as we say in Ireland. Yummy! Yummy! Yummy! I knew someone who liked to spread Marmite on their toast, before topping it off with beans. Marmite is a dark brown, salty, savory spread made from yeast extract. Not for me, but everyone adds their own little touches to make their beans on toast special. Finely diced onion can be caramelized in a pan before adding the beans for heating. A dash of Worcestershire sauce and mustard kick the flavor up a notch. I suppose these steps bring the beans a little closer to American BBQ beans. 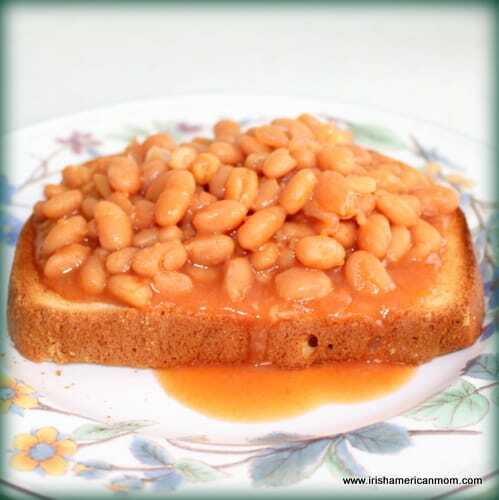 A slice of cheese, grilled to melting point on the toast, is delicious hidden beneath the beans. My mouth is now watering thinking about bland old beans on toast. As children we loved to drink a cold glass of milk with our beans, but as I grew older I replaced the milk with a nice cup of hot tea with a little dash of milk. Again, most Americans are probably aghast at this menu combination. But the plain old fact is, I have Irish taste buds. Here in America I buy vegetarian beans. No pork and beans in this house. I’m not fond of a piece of pork rind floating in my beans as they heat. A can of vegetarian beans reminds me of Irish beans the most. Luckily, my local supermarket stocks Heinz vegetarian beans. Wishing you all happy and easy lunchtimes. All the best, and have a great weekend. Thanks so weird! There are probably Dad/forbidden food stories in every family. Thanks for sharing! You enjoy your weekend too! It’s onions for my hubby. I’ve come up with strategies to hide them in my recipes, because there are somethings that just aren’t the same without an onion. With my husband it’s tiny corn on the cob that are in salad bar buffets. Unfortunately I had a problem remembering, not the dramatics but the results…did he say he hated them or loved them?? Most people don’t freak out when given one thing that can be so easily removed, but drama? What can I say, he’s Irish! Every time I pick up a salad bar to go for him, I remind myself….NO Tiny Corn Cobs. I completely understand, Debra. I too am married to an Irish man. I suppose we vowed to love them, quirks and all. omg…this post just delighted me! My hubby introduced me to his beloved beans on toast when we married, and quite honestly, I thought his taste buds were a bit strange. LOL. However, I’m now a true convert; and often make a light supper of this when neither of us feel like cooking a full meat n potatoes, two veg kind of meal. 🙂 The only difference is that we prefer Heinz beans on top of nice toast, buttered with nothing other than Kerrygold and a lil dash of salt. 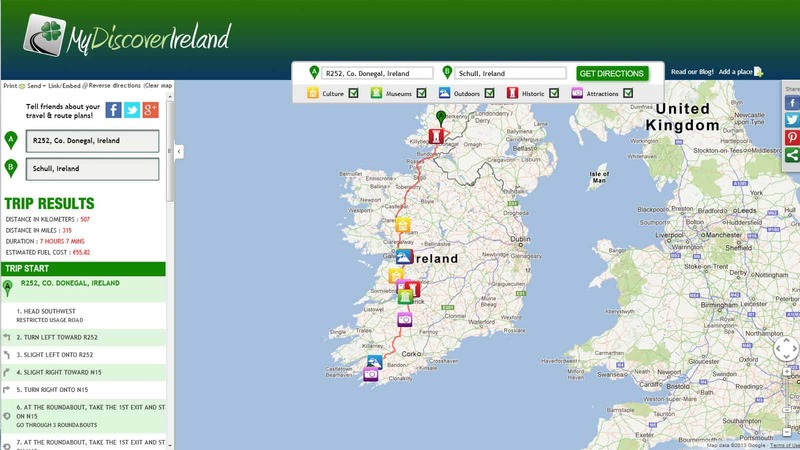 We even have to travel 40 miles to the nearest store that carries the Heinz beans and Kerrygold butter. We think it’s worth the drive! Amy – I’m glad to hear you’re a “beans on toast” convert, and that you enjoyed my ramblings about beans. Like you, I do prefer Heinz beans to the American vegetarian beans, but when I can’t get my hands on a can of Heinz, I settle for the vegetarian kind. Luckily, my local Meijers supermarket stocks Heinz beans most of the time. My pantry usually has a few cans on stand by. They really are perfect for a light supper. All the best, and thanks for joining in our bean discussion. Charles – Thanks so much for clearing up my singular vs. plural dilemma. I really was in a bit of a quandry. It’s amazing how many recipes in southern American cooking are very similar to menu items in the British isles. I suppose immigrants brought their tastes to America, took the available ingredients and devised new ways to produce somewhat similar results. Take care, and enjoy the rest of your weekend. I have been told that the Appalachians were settled by people from Ireland/N. Ireland & Scotland so I suppose they brought their cooking with them. I’m pretty sure southern biscuits are derived from Irish soda scones – they’re very similar. However, I can’t think of an Irish recipe link for the white, sausage gravy southerners love on their biscuits. The links between Scottish/Irish cooking and southern American fare would be a good topic for a blog post someday. I should start researching it. Beans for lunch? What a good idea! One of our favorite non-summer meals is brown beans, gravy and fried potatoes rounded off with a nice tossed salad. And there are always leftovers. Now we have a use for them come the midday meal next day. Beans are a good staple to have around, both canned or dry. We have a twenty-five pound bag of pinto beans on reserve should “the unexpected” happen. This year’s garden has two rows of yin-yang beans, colorful black and white shell beans, that would really decorate a slice of toast. An addendum to Charles’s grammar tip: when you refer to “beans and toast,” would you substitute “it” or “they” for the combination? If the former, then the singular verb is correct; the latter, a plural verb. Whichever the choice, it’s best to be consistent: “Beans on toast” is an inexpensive, yet nutritious meal. Thus, beans on toast “suits” me just fine. How refreshing it is, though, to find someone these days who’s actually concerned about grammar! T.M. – I was thinking of that very scene from “Blazing Saddles” as I wrote that last line. Luckily, cowboys spent many a night sleeping beneath the stars in the “fresh” air. Thanks for adding to our little grammar lesson. Sometimes I find it hard to edit my own writing, and I have to really pause to think through my grammar rules. I’m sure some of the nuns, who taught me grammar long ago, are wagging their fingers at me from heaven when they see some of the blatant errors I make. A girl I worked with in Florida many moons ago always made the best crockpot beans for potluck lunches. I never got her recipe, but someday I hope to replicate it. Maureen – Like you I use real butter, and real Irish butter when I can get my hands on it over here in America. Kerrygold is beginning to be sold in nearly all the supermarkets. Spreads don’t have the same flavor as good, old butter. I like your friend’s tip of adding curry powder. I’ve never done that, but I’d say it adds a great kick at the end of every bite. Take care, and I hope you are enjoying your summer. Those two cartoon characters for bachelor’s beans were named after a customer competition. A lady who lived close to us in Arklow, Co Wicklow won the competition. And the winning names were “Beany” and “Barney”. Robert – I had forgotten the famous Bachelors’ names, but once you mentioned them, “Barney” and “Beaney” came flooding back. Your neighbor in Wicklow did a good job naming them. Thanks for stopping by to check out my ramblings. Kay – Whenever I can get a can of Heinz that’s what we have. They’re the best. I think the secret is in the sauce. It’s not as sweet as the American vegetarian bean sauce, so suits my palate perfectly. This is such a simple idea. I don’t normally care for beans; however, a neighbor of mine kept bringing me her white bean chili. II kept eating it…then one day I decided that I really loved it and just had a hard time admitting it to myself! I add a lot of fun toppings and sides to it; and now it’s one of my favorite dishes! I actually posted the recipe on my blog a while back. I could see myself actually enjoying beans on toast now…boy, I’ve come a long way! Bonnie – It’s so simple and nutritious, and a favorite with busy Irish moms because it is so inexpensive. Glad to hear you have acquired a taste for beans in recent years. 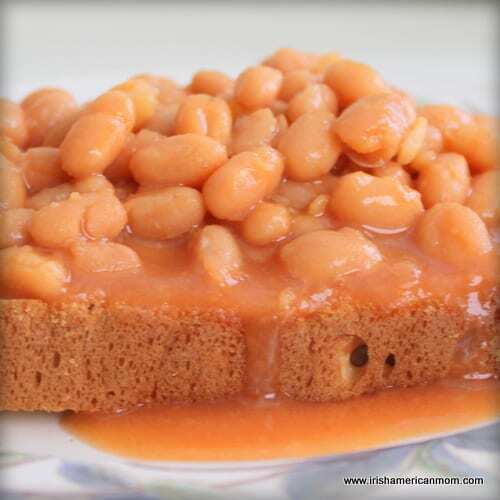 I love BBQ beans cooked in a slow cooker when all the flavors have plenty of time to meld. I’ll have to check out your bean recipe. Hi Mairead, I think you could have another post on just beans, as they are as different from the sections of the US as they are from Ireland. In my part of the world they are sweet with molasses and yes a piece of salt pork usually served with franks not in a bun with a side of Brown bread from a can which also is sweet dense and raisiny. Not at all like bachelors, or tomato based beans, or red beans and rice or black beans.. but all might have this little song in common. Beans beans the musical fruit, the more you eat the more you toot, the more you toot the better you feel, let’s have beans for every meal. Brian – So true, beans come in many varieties and I love the differing ways they are prepared throughout the U.S.. A whole series of posts could be written on the amazing bean. As a child, I remember chanting a slightly different version of the age old rhyme you shared. I’m afraid our beans were good for the heart, and you know where that leads to for poetic rhyming purposes. On another note, Boston beans sound very good, but I’m afraid I’d leave the piece of pork rind in the pot. Thanks also for introducing me to Boston brown bread. Believe it or not, I never heard of it before, so I checked it out on the web. Baking bread in a can is quite ingenious, and the ingredients are definitely nutritious. Someday I may take a shot at baking one. Salt Pork is meant for flavoring only. good luck with the boiling of the brown bread. Thanks, Brian. The salt pork does add great flavor. 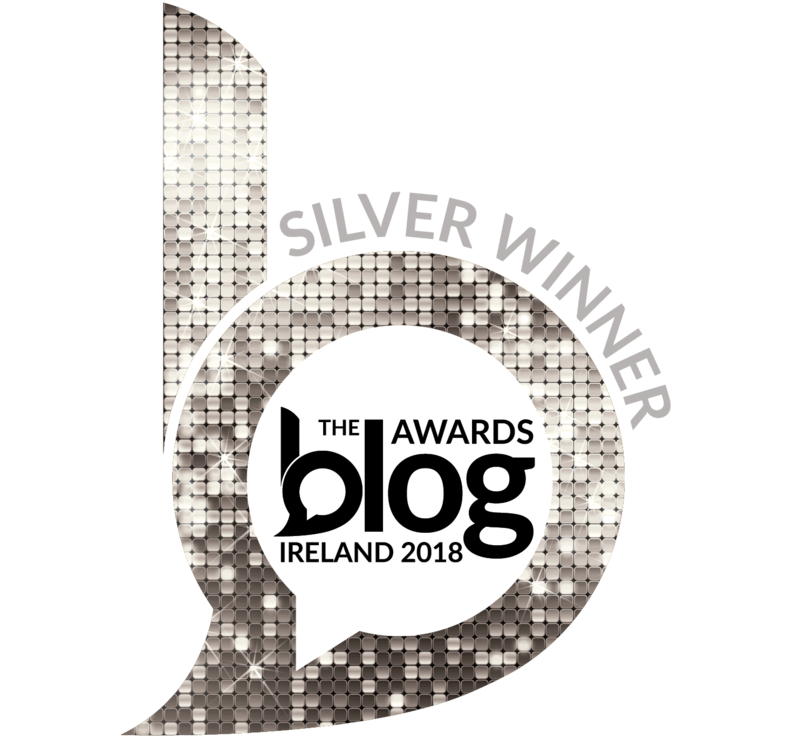 I don’t know why I have a problem looking at it, since I’ve been known to cook liver and onions, pressed tongue, and I love good old breakfast pudding, the infamous blood sausage of Ireland. Cheryl – The possibilities are endless for perfect pairings for beans on toast, but I do agree, a few slices of bacon are extra delicious. So I get this from my Irish heritage? Wondered why I like it..
Mike – A love of beans is not just an American thing. Those beans on toast loving genes of yours are definitely Irish. 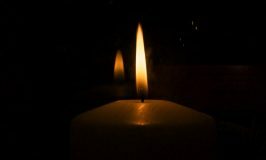 Best wishes, and thanks for checking out my ramblings. 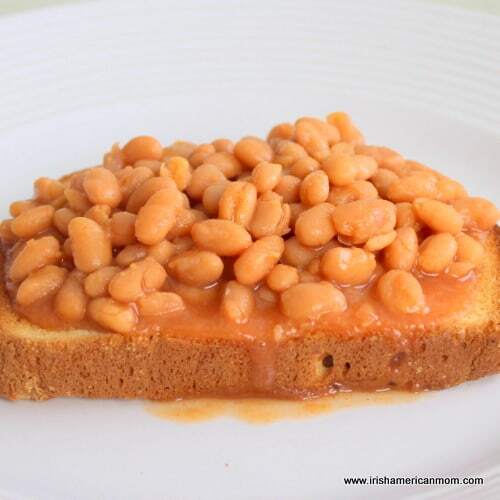 My american kids love beans on toast especially on a cold day. I was thrilled to find them in abundant supply in a nearby indian grocery store, along with other favorites eg. digestives & lucozade. Now all we need is Brennans bread! Recently went off to Ireland to learn more about my heritage, beans and toast were one of my favorite new foods I encountered (All the food was delicious, I ate the best salmon and drank the best cider of my life in Ireland) My mouth waters reading this post, beans on toast and fried tomatoes will become a regular for breakfast and snacks. It will make a great quick breakfast while camping too! I’m also convinced it helps prevent /cure hangovers. P.s. I’m American and also think peanut butter and jelly sandwiches are the worst. 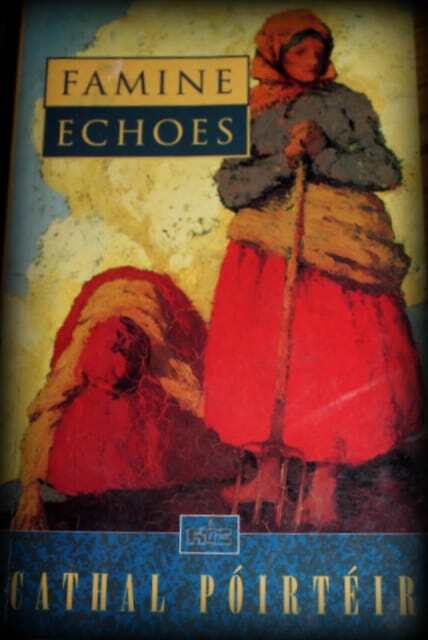 Hi Kathleen – Lovely to hear you had such a lovely time in Ireland and that you thought the food was delicious. Fried tomatoes are a very Irish and English breakfast delicacy. You can’t beat them with a good fry. Thanks for stopping by and checking out my lunch recommendation – beans on toast is a taste of my Irish childhood.